GARDINER, MT (BP) — Most churches would consider closing their doors if their active membership dipped to six people, but Gardiner Baptist Church is holding steady. The debt-free congregation — located near Yellowstone National Park’s north entrance — is raising money for a two-story community building on its two acres to serve as a food pantry, thrift store and medical clinic — with emergency housing upstairs — for the town of 875. Other church ministries include supporting the local food bank; providing space to the town’s physical therapy center and counseling center, along with community use of its playground; and the GBC House Band (as in Gardiner Baptist Church) — with Pastor Britton Gray as lead vocalist — performing once a month in the basement of a local gathering spot and tourist attraction called the Two-Bit Saloon and Grill. Though Gardiner Baptist has both an Internet and facebook presence, the church’s building and playground on the town’s main thoroughfare — US 89 — often are the first awareness visitors have that Southern Baptists minister year-round to local residents, hundreds of seasonal workers and multiple thousands who venture to Yellowstone each year through the north entrance. Five to 10 people visit Gardiner Baptist Church each week in the summer — more when a mission team is in town — so in 2017 average Sunday worship attendance was 22. Members, mission teams and Yellowstone visitors help the church conduct block parties, outdoor concerts, Bible distribution, five-day kids’ camps and other outreach activities. Gray is bivocational, serving as structural fire chief responsible for the 1,600 buildings in Yellowstone, including lodging for 20,000 guests, and vehicle accidents on the park’s 466 miles of roads traveled by about 4 million visitors a year. Church members often find people in vulnerable moments, such as the middle-aged man with medical issues, the recent retiree new to town, the Yellowstone employee farther from God than she realized until God used Gardiner Baptist to get her attention. Gardiner’s ministries start locally but have reached out globally. One Yellowstone visitor from Bulgaria was so impressed with the church’s food pantry — started in 2005 by Linda Gray and daughter Ayla — that the visitor started one in her home country. 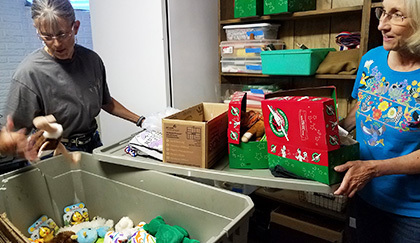 But perhaps the church’s most far-reaching effort is acquiring items to fill shoeboxes for Operation Christmas Child (OCC), a Samaritan’s Purse ministry. That’s up from 40 in 2011, the first year the church participated, and twice the number typically packed by churches of all sizes, according to an OCC spokesperson. Not that it’s easy, with just six active members, though that number fluctuates as people move into and out of town. The church, built in the late 1970s, may be spacious but its repair and renovation needs are constant, as are those of the parsonage. “We have rooms we close off in winter because we can’t afford to heat them,” Sue Oliver said. “We stay on our knees constantly, asking God to move people’s hearts and help us reach this lost community. Along with the challenge of staying open are the needs of people dealing with the financial struggles of living in a high-value area, Linda Gray said. Many rentals that once were affordable have been turned into high-dollar vacation rentals by new owners, meaning local people often work two or more jobs to make ends meet. When asked how that was possible in a church with such limited resources, she shook her head and smiled.